Christopher Moore's writing style continues to thrill me. It's just the right combination of quirky, laid back, and warm hearted. Leave it to Christopher Moore to make Christmas so incredibly horrible and incredibly wonderful at the same time. I loved how we saw characters, or references to characters, from nearly all of his books. I recognized names from Practical Demonkeeping, Lamb, Fluke, Lust Lizard, and Love Nun for sure, and think a maybe for Bloodsucking Fiends. I didn't recognize anyone from Coyote Blue, but that may have just gotten by me. This book was a clever way of tying some of these stories together. The Stupidest Angel is a return appearence from Lamb, and boy is he stupid...but way cool. My favorite parts had to be the graveyard conversations and the avenging angel. These parts cracked me up, and were well enough written that I could picture them vividly. 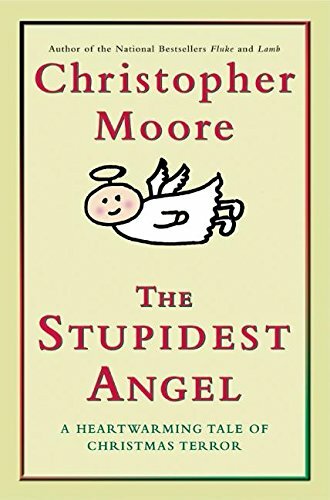 The Stupidest Angel isn't one of Christopher Moore's best books (some of the puns and gags seemed forced, and others just didn't work well), but it's a lot of fun nonetheless. It seems more like a gift to his fans than a real serious attempt at a new novel, but it's certainly enough to keep me satisfied while I wait for the next one.